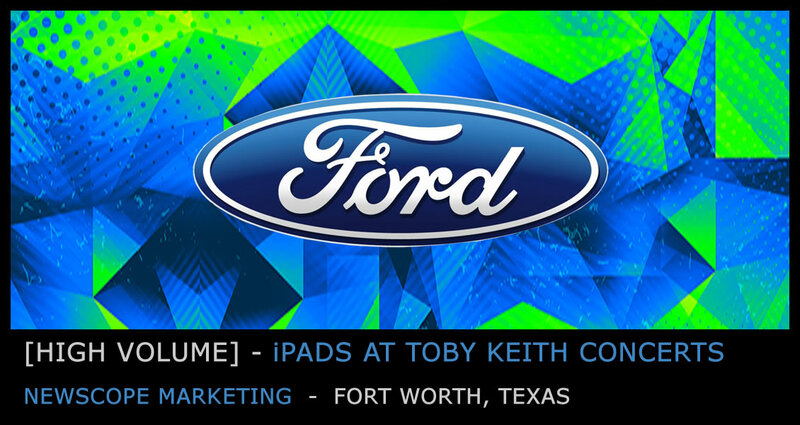 Newscope Marketing, working with Ford Motor Company, went along on Toby Keith’s Shut Up and Hold On concert tour. In exchange for answering a few survey questions, Ford gave users a chance to win a Ford Super Duty Pickup. Needing to capture a LOT of data in an outdoor environment, coupled with the fact that many concertgoers were Spanish speaking presented unique challenges. By offering a chance to win a FREE TRUCK, Newscope had no trouble getting concertgoers to give them some quick data. Canvassing the crowd with several iPads loaded with an iCapture lead qualifying questionnaire, they were able to capture contact info, product preference and purchase timeline data for over 17,500 contacts during the concert tour, all without an internet connection. With such a huge prize giveaway, Ford’s legal team demanded a safety net. iCapture’s Waiver Agreement question allowed them to get their Terms and Conditions for the truck giveaway clearly spelled out and agreed to by each entrant. Allowing users to answer in their preferred language greatly enhanced engagement and increased both the quality and quantity of captured data. All while making a positive brand impression for Ford Motor Company.